Click on the sword for additional details ! WWII Japanese Order Of The Rising Sun 7th Class - This is a WWII Japanese Order of the Rising SUn 7th Class medal. Complete with the issue box. 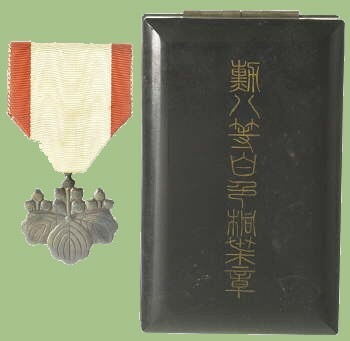 The Order of the Rising Sun was awarded to military and civilian personnel for general merit. This award was given extensively to Japanese and foreign individuals. The award comes in eight different classes, or six classes and two decorations. Awards are made according to class, from the 8th class for Privates to the 1st class for Generals. A large number of copies have been produced over time in Europe for the purpose of replacing missing awards or for the earlier collector trade. Most of these copies have mistakes in manufacturing that make them recognizable as such. Some of the common mistakes include the incorrect attachment of the Pawlonia, incorrect design of the Pawlonia. The 7th class decoration of the green Pawlonia leaves constructed of 31 mm x 33 mm, of silver and enamel on both sides. The construction of the ribbon is primarily black with 6 mm red edges. The official width of the ribbon is only 30 mm, but some of the earlier badges have been recorded as having widths of 36 mm. These older ribbons were usually unwatered dull black with crimson edges. The modern ribbons are watered, pure bright with bright red edges. 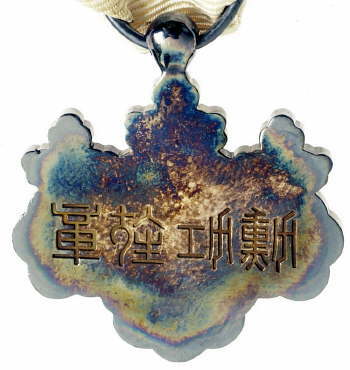 This page is a recognition and identification guide for Japanese WWII medals. Multiple detailed photos of a specific sample are provided. Descriptions point out specific	points that should be noted. One of the most commonly asked questions is "How much is my Japanese medal worth?". A price guide is included here to address this question. The value of the WWII gear is reviewed over a period of several years. A trend can be observed. The present worth of the items in the collector's market is illustrated. Many WWII Japanese medals are currently reproduced. It is becoming more difficult to be able to tell the fake ones from the real ones because the quality of the reproductions is improving. The collector must become familiarized with the construction style and materials employed in the manufacturing of this item. Attention to the details is critical in order to be able to determine the authenticity of the collectible. If you have an interest is seeing other WWII Japanese items, you can do so by going to our WWII Japanese Collectibles identification guide, where we discussed items from different groups and organizations. Values for medals, badges, and other military antiques and collectibles are provided as a means to educate the collector community and individuals who have a general interest on the field. The following is an estimated value. Prices may vary in every state and every country. This service is provided courtesy of MilitaryItems.com . The source for military antiques and collectibles in the web.